I can honestly say that this trip was worth every penny of it. Not only did we experience so many different activities for the first time, like snorkeling, riding an airplane, or hiking up a volcano, I also made new friendships that I hope will last a lifetime. We tried so many foods that we probably wouldn't even think about trying back home. For example, guinea pig.. which by the way tasted like chicken. There were so many different species of animals that you can't find anywhere in the world. From animals of the sea, of the land, and of the sky. Not to mention, the view from the majority of the hotel rooms were pretty amazing. 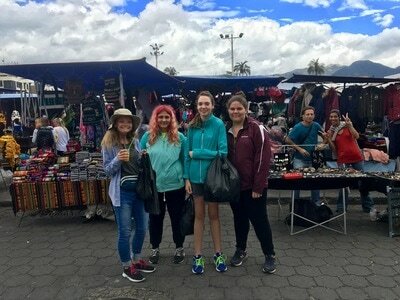 It's true, there were problems in the beginning with the airplane malfunctioning, but at the end we experienced different cultures, social life, and customs from the native people of Ecuador and Galápagos island that we wouldn't even begin to understand if we stayed at home in the states. 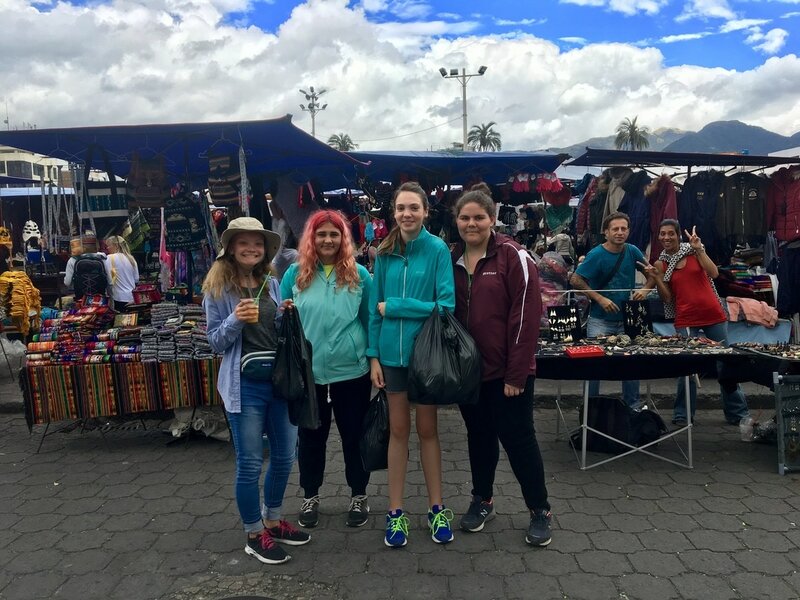 During this trip we went to the markets of Otavalo and learned that many people are going to try to rip us off, but a few bargaining tips can go a long way. Many of us got our souvenirs at a lower price from the original price, thanks to Mr. Molfino. A fellow classmate even went to the grocery store and used his bargaining skills to lower the price of Gatorade. In which he succeeded. Overall this whole experience was something I'm sure none of my fellow classmates will ever forget. It will be something that we will be able to remember forever by cherishing each moment we spent with each other, and remembering each memory we created. View more photos from Day 9 HERE! The morning got off to a great start! Wake up was at 6:30am, yet Mr. Walker knocked on our doors at 6:55am. As we all walked downstairs to the cafe we realized that this would be our last sit down breakfast on this amazing trip. As we all filed on the bus one by one still tired from the morning, we were surprised to see Luis was about to do a lecture! He talked about many things, such as the beginnings of Ecuador and the Galapagos, the economy of the islands, and the Spanish invasion of Ecuador. After we got off the bus after a class-like hour, we finally reached the equator. Along the line there was a big stone circle, and in the center stood a huge hollow tube. The giant circle was a huge sun dial! We learned how in ancient times people figured out that the approximate location of the equator was there based on the sun. 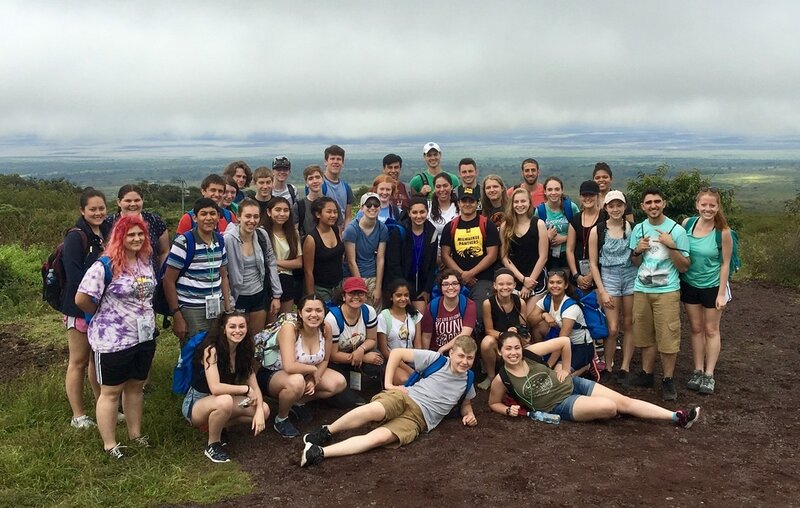 Our Galapagroup had reached the center of the surface of the earth - a true Ecuadorian experience! Now began the fun part. Mr. Molfino taught us the night before the secrets to obtaining quite cheap items. 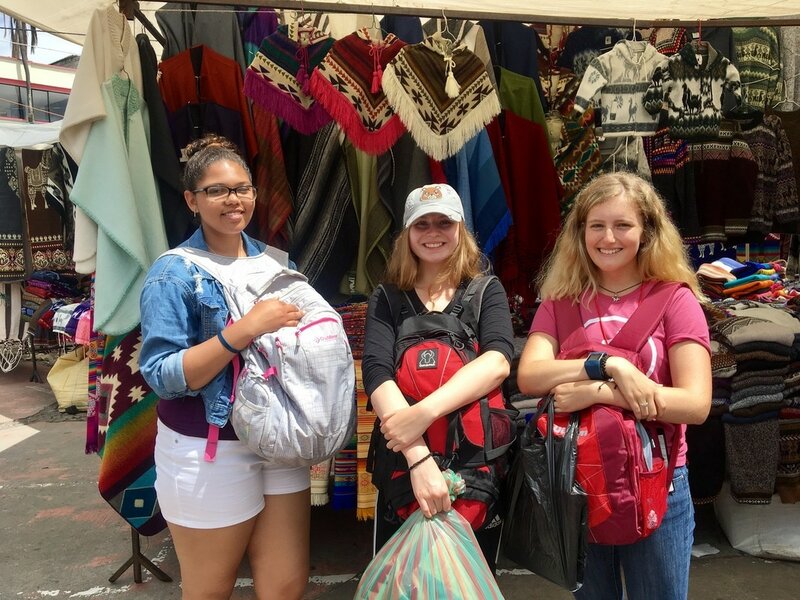 Many of the students today returned back on the bus with many items bought at below market price. 2. Tell the clerk you want the item for 1\2 of what he is selling it for. Stay firm and do not rise what you want to pay for the item too quickly. 3. Only put the amount of money you want to spend on the item in your wallet, and show this this is all I have. 4. If the clerk will not move his price ask him throw in a smaller priced item with the original item. 5. JUST WALK AWAY. When they see you walk away they will thunk they lost business and most of the time accept your offer. The students below used a combination of all these techniques to achieve their price. 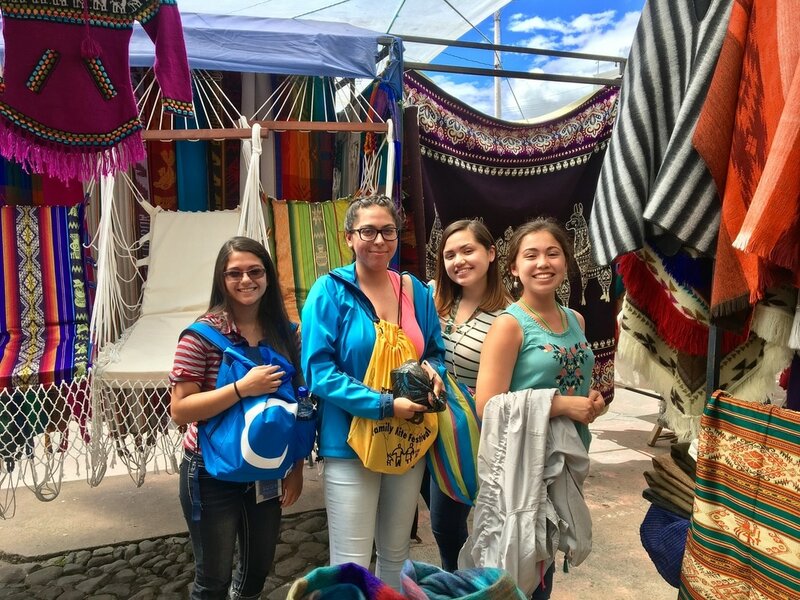 "As I was walking around my friend Gabby saw a Poncho which she wanted for sure. It was white with stripes of shades of blue. When I went to ask the shop owner the price of the poncho, (keeping in mind my Spanish 1 knowledge from Senora Moore) the owner firmly replied "Catorce Dollares" Now Gabby was about ready to start and ask for a lower price, but I remembered I saw that exact same poncho at a different shop. I calmly told her about the other shop and we should see their price before even starting to bargin. As we approch the shop which I had seen the other poncho, I became more and more excited, because the last shop had only a few, on the other hand this shop was all ponchos! It was like we stumbled on poncho world! I asked how much it was and to our surprise the owner said "Ocho dollares" which was already $6 less the the other shop before we even started to work our magic! My set price was $6 so I asked the man in Spanish if I could buy it for $5. He said no at first, but he eventually went down to $7 one dollar more then the set price. So I walked away. As I was walking away he finally said "Vale" which means Okay. We went from $14 to $6!" After we saw all those beautiful wool scarfs and blankets at the market we needed to know how to make them as well! 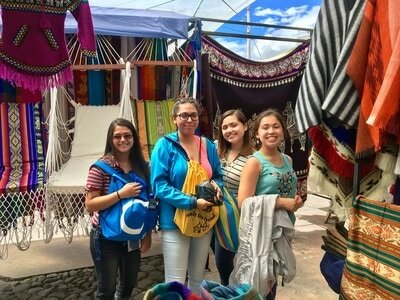 We went to El Gran Condor, where a husband and wife duo fully hand-make all of their textiles! We experienced how different substances are used to color the fur. We all walked to our last dinner in Ecuador. The food was exquisite! Before the meal was over, a speech was made to Luis who by everyone's standards is LIT. Michelle, Gabby, Natalie, and Rohit all gave a closing speech at the end of dinner. "Don't be sad that it is over, be glad that it happened." Today was definitely one of the many highlights of the trip. We woke up early and took a fairly long bus ride to the equator line. The weather didn't seem completely on our side, but it takes a lot more than that to ruin the Galapagroup's fun. We got to learn so much about the equator such as views on constellations and true and false myths. I decided to put one myth to the test: if you stand on the equator line, it is impossible for you to be pushed over. One of my chaperones Mr. Molfino and I tested it with me standing on the equator line and him trying to push me over. I was able to leave with the information that that myth in particular is in fact FALSE. The group was about ready to leave when I had remembered something. I had brought my fidget spinner on the trip with me solely for the reason of taking a picture with it on the equator line. I realized had left my spinner on the bus, and asked for permission to go get it. When I finally did, everyone was boarding the bus already, so I ran in front to get my spinner and ran back with one of my friends to take my picture. Everyone was asking me what I was doing, and laughed with me when I came back and explained what I did. I was the last one to board the bus, but it was all worth it. 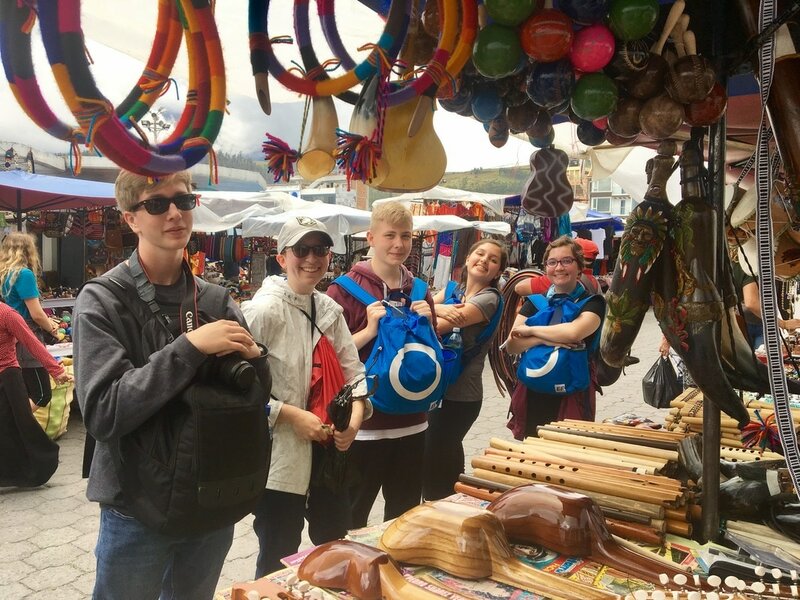 Afterwards, we took another long drive to the Otavalo Markets, which was one of the most fun experiences I've had on this trip. Our chaperone Mr. Molfino had taught us how to negotiate with the vendors the night before, and we were finally able to try it. I bought plenty souvenirs for family and my techniques worked pretty smoothly, but there was this one purchase that was a lot more difficult than all the others I've made. I was in search specifically for a necklace, and I finally found one that caught my attention. I asked how much it cost, and the necklace was very expensive at about $30 because it was supposedly made out of silver and a rare piece of rock. My offer was rather ridiculously low for $12, but it was worth a shot. After long minutes of challenging and bargaining, my top limit had reached $17, and his lowest limit had reached $23. I realized we weren't getting anywhere near my offer anytime soon, so I used the classic technique of walking away. Almost right away I found a different jewelry stand, and found a very similar necklace. After a short bargain with the new vendor, I got him to drop his price to $17. I immediately put the necklace back and thanked him and walked away. I was never interested in buying the necklace, I was only interested in comparing the price. I couldn't return to the original vendor right away, because then he would think I was desperate and keep the price at a high. So I continued to do more shopping, and after a decent amount of time I found his stand again. I passed by it, purposely ignoring him and quickly glancing at the necklace but continuing to walk away. He recognized me of course and stood up calling me back over. His price didn't get any lower, so I pretended to not be any more interested and walking away. He kept calling me back making sure he wouldn't let my business slip away again. After not lowering his price any lower than $23, I mentioned the other vendor selling me a very similar necklace for my price and that I might buy that one instead. In worries that I might lose complete interest, he lowered his price once again, but not to my wanted $17. I came to an agreement to pay full price for the necklace, but only if I was able to to take a bracelet for my older sister. He was hesitant, saying that the bracelet was expensive being made of pearls and another rare rock. It was about time for the group to meet up again and I had realized he had reached his ultimate minimum, and with more long minutes of bargaining, we had FINALLY come to an agreement of $29 for both the necklace and bracelet. I left the market happy with my many purchases. The full price of the bracelet was $12, so I assume I payed full price for it, and finally managed to get a deal of $17 for the necklace. The necklace and bracelet didn't seem so much worth the money, but very worth the story that comes with it because I worked my hardest to negotiate for it. View more photos from Day 8 HERE! The morning was swell. Lemonade was served with breakfast and it was fresh and quite tasty. Granola - something I have missed - was also served and it was wonderful. After breakfast we hopped on the buses to go to the Centro de Interpretacion Ambiental which was a museum; however, since we technically didn't have an official Galapagos tour guide with us we had to be very quiet or risk getting in trouble. It was actually really nice to be quiet though. Everything was really fast and loud the past few days so having some silent time to learn things about the islands was really really nice! The museum was not only incredibly informative on the history of the Galapagos, it had a few paths down to a small beach full of sea lions and a more off-path trail leading down to the road. There was certainly some interesting graffiti that we have pictures of, so you'll just have to wait to see. After that mini excursion we stopped back at the hotel, and the hotel's cat was out and about, checking us and our suitcases out. We've seen a TON of dogs on this trip so seeing a cat was super nice. We then split into chaperone groups to find lunch. We ended up finding a guy who was selling empanadas (chicken or cheese) and they were HEAVENLY. I could've eaten them all day they were so good! We also got to see more of the colorful buildings on the street. I've noticed the colorful buildings before in Puerto Rico as well, as they're usually bright pink, green, blue, or yellow, and the roofs are usually a salmon-pink/red color that looks nice from above. After lunch was the airport and our flight, which was definitely much better than our first few flights getting here! The clouds looked AMAZING today, like you could run your hands through them like soap in a bubble bath. On the plane I sat next to a girl named Emma, and she was from a small school group from Spokane, Washington, and also touring through EF! We chatted for 2+ hours and it was really nice. Apparently people in the Pacific northwest are obsessed with hammocks. Almost everyone in her group bought a hammock while they were here. We talked about food, specifically Wisconsin burgers and frozen custard which I miss dearly. I can't even begin to describe how I felt looking up at the buildings in Quito, but I'll try: everything is on a slope upwards, and you could see the individual levels of streets as the houses ascended, it felt like they were towering over us! Finally, we got to our hotel which looks very pretty, with lots of flowers and accents of pink, as well as a metalgate of art-nouveau-esque curves out front. Today was gorgeous and I can't wait for tomorrow! View more photos from Day 7 HERE! Urchins, Lions and Turtles. OH MY! All of the sea variety of course. Our last full day on the islands took the group to beautiful San Cristobal. This island is home to 8,000 people (including our three nature guides David, Danny and Jorge), and is the political capital of the Galapagos. 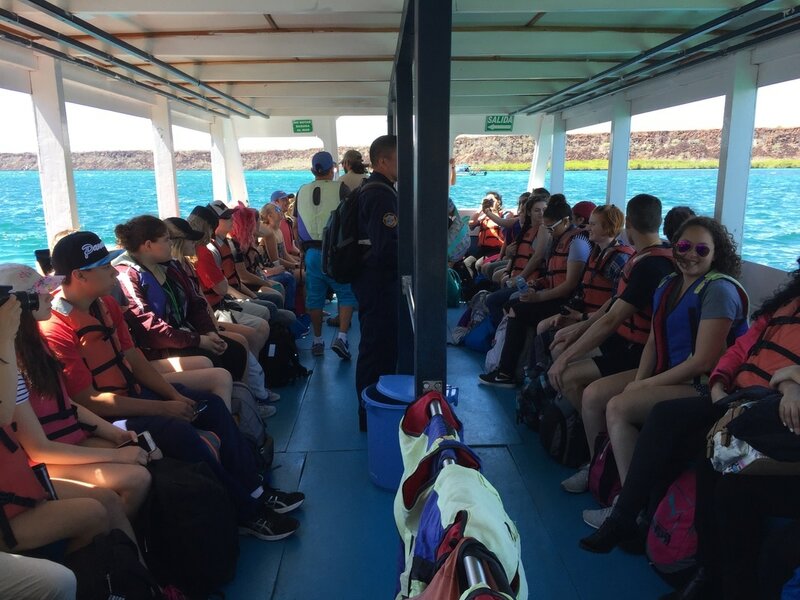 Here the Galapagroup shared some incredible experiences like observing wildlife, snorkeling, and exploring the downtown area. San Cristobal is home to the largest colony of sea lions in the archipelago. The island is home to over 4,000 of the tame, fun loving creatures. The students observed the colony and learned about their behavior, relations and breeding. Sea lions spend their days sunning themselves, playing in the water, and hunting for fish. Emma and Josie took particular interest in the sea lions, taking it upon themselves to name each and every one of them. "We named almost all of them" said Emma. "Our favorites were definitely Leanne the grandma, Coco and Onix, and of course Gerald because he is the silly sea lion from Finding Dory!" Speaking of Dory, the Galapagroup then departed on a mission to find her. The Galapagroup's major excursion of the day was a trip to La Loberia cove for snorkeling. This was a magical experience for the students. La Loberia is a beautiful crescent shaped beach with clear waters and plenty of wildlife. Gabriella S. and Rosie could hardly contain their excitement. "We saw sea turtles and sea lions! It was incredible!" Samantha took perhaps the best photo of the trip while snorkeling and swimming with a sea lions (see right). Gabrielle literally found Dory and Nemo. This was a once in a lifetime experience for our students. The only thing better than seeing the animals was seeing the students' reactions. Dinner on San Cristobal was at a restaurant called Calypso. This was our last dinner on the islands so the group dressed up (see picture below). Here we celebrated Kirstin's birthday and bid farewell to our guides and friends, Danny, David and Jorge. 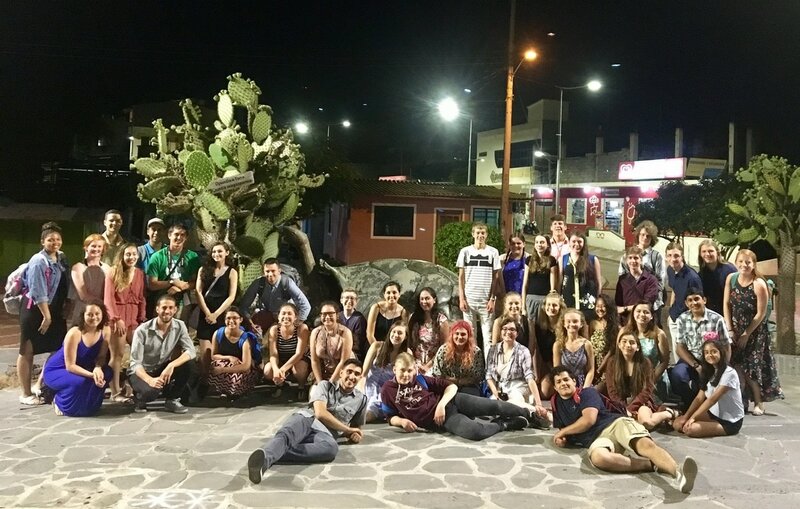 After dinner the students had time to explore the city center of San Cristobal which was a fun experience for Josh and Adam. The two explained that they had fun interacting with the locals. 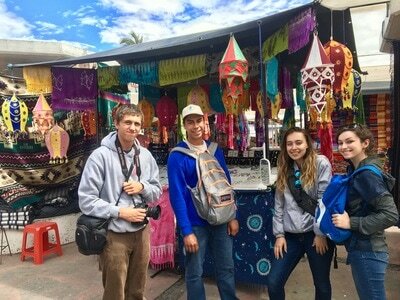 Adam explained, "My favorite part of exploring San Cristobal was practicing my Spanish. I surprised myself with my skills and I gained a lot of confidence for the rest of the trip." 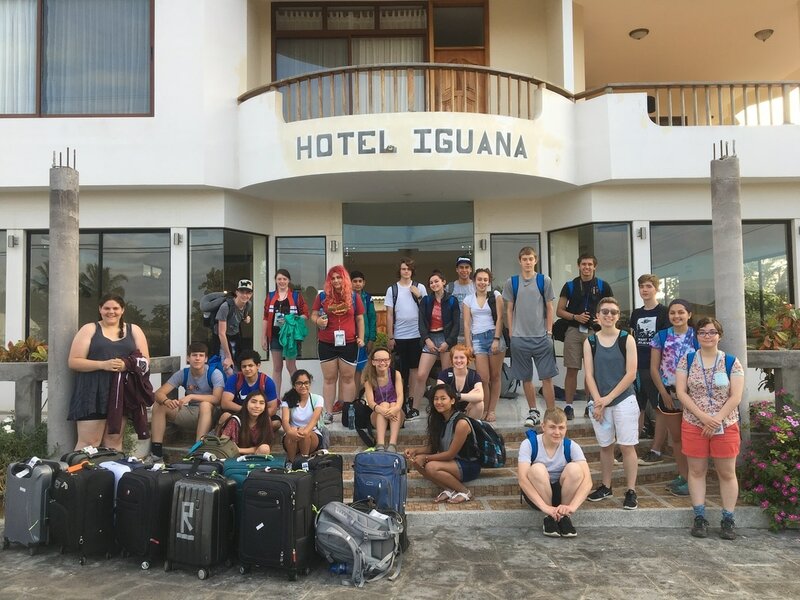 ​The Galapagroup bids farewell to the "Enchanted Islands" tomorrow afternoon but we are all grateful for our time here and have grown as people and students through our experiences. ¡Vamos a Quito! View more photos from Day 6 HERE! Today, the Galagroup had a busy day on Santa Cruz Island. Although it was tough to say goodbye to Isabela in the morning, an informative trip to the Charles Darwin Research Center along with a noteworthy hike across the island to the beautiful Tortuga Bay made the day unforgettable. Below, seven students outline their experiences of the day. ​Breakfast on our final day in Isabela Island was really amazing. It consisted of huevos y pan con café o leche. There were also a ton of fruit choices. After taking a long boat ride to Santa Crúz we stopped at a restaurant where we had many food options between beef and rice, lasagna, fish and vegetarian spaghetti, which was given to us along with either fish soup or a pumpkin soup. Finally for dinner, we ate at a restaurant called "Galapagos Planet" where there were choices between pesto pasta, fish, and a beef dish. The dinner really finished the night out greatly. Saying goodbye to Isabela Island was really tough, but now we were headed to Santa Cruz, another beautiful island of the Galapagos. We arrived at the dock and boarded the water taxi as usual. About 11 people per taxi, and 22 in both speedboats. I was not very excited to get on the boat. Last time I sat in the inside, which had me feeling a little sick. This time, I made sure to sit in the back in the outside area of the boat. Everyone put on sunscreen and had their life jackets on. We were able to keep anything we wanted during the ride. I chose to keep my camera and water bottle. What I also should have kept was a hat since it was really windy and messed up my hair. As the boat started to move, I felt pretty good and the water was so beautiful. The waves occurring by the motor made a cool effect in the water; it was really pretty. The sky was so blue which meant the water was too, and the clouds looked perfect; I took many pictures. We were side by side to another island, which I later found out was Santa Fe Island. About an hour after we passed it, I could still see it's little silhouette on the horizon. I had never experienced the ocean like this and I'm really glad I did. I did not want the boat ride to end, looking at the water was just so pretty. The sea was calm so I wanted to fall asleep, but I promised myself I would stay awake the entire time - mostly because I wanted to take in the whole experience, but also because I didn't want to fall asleep on someone's shoulder, kind of embarrassing. In the end, it was totally worth it, I would definitely go on a boat again in the future, an experience I'll never forget. Even thought I did not want the boat ride to end, we made it to Santa Cruz Island. What awaited us were more unforgettable adventures. Today we went to the Charles Darwin Center. As it turns out, historically there were 14 different species across the Galapagos and nowadays, due to over-hunting and human expansion in the islands, there are only 11 species left. At the Center, they are helping repopulate 4 of these species. At the Center, we learned about Super Diego, a relatively young tortoise (only about 80 years old!) from Espanola Island. We learned that he is being used to help repopulate his species, and currently has around 800 kids. We also learned about Lonesome George. The day he died his caretaker quit. The reason why they called him Lonesome George is because he had a favorite rock and would never mate with a female. They have him in a cold room to contain his shape. Overall, I think it was a great experience and we all learned a lot. The hike was a very strenuous and it took about more than an hour to get to Tortuga Bay. I wore sandals which actually helped a lot since my feet were so sore in my tennis shoes. What made the hike so difficult is that there were many uphill paths, but we conquered it! Even though it was a very difficult hike, we saw some beautiful scenery - some of Darwin's famous finches as well as some smaller lizards that would occasionally cross our path. After hiking for about an hour, I saw the ocean. The view was so breathtaking that it felt like I was seeing the ocean for the first time. Today the Galapagroup was presented with yet another opportunity to go swimming. After a two mile hike down a long trail we were gifted with a beautiful ocean view, but the journey doesn't end there. Upon arriving to the beach we had to walk another 15 minutes to an area that was more calm. After the 15 minute scenic walk along the ocean we arrived to Tortuga Bay. It was stunning. The water was so calm and the color of the it was breath taking. After applying a lot of sunscreen, everyone was ready to jump into the water. Everyone was smiling and having a blast. Some were building sand castles and burying each other in sand, while others were playing water volleyball or even just floating in the water relaxing. As everyone was getting ready to go, someone pointed out what seemed to be either a manta ray or a sting ray. To me that was a memorable experience because I've never seen a manta or sting ray that wasn't in captivity. My time at Tortuga Bay in certainly a memory I will cherish for the rest of my life. 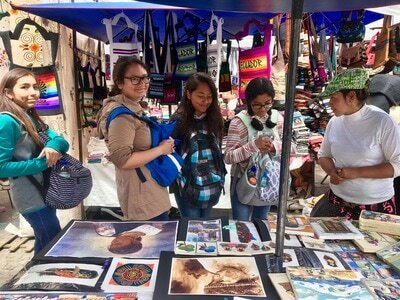 When we were in Santa Cruz and San Cristobal we went to local tourist shops. Each one was filled with plenty of shirts and hats, along with maps, figurines, jewelry, keychains, and more. When shopping for myself, I got a shirt that says "I like boobies" (FYI: this is a bird) along with a map and a small figurine of an iguana; I have gotten plenty of things for my family to enjoy from the trip as well. Can't wait to go shopping in Quito to see what else I get- and struggle to fit it in my luggage or backpack. After dinner we had some time before we had to be back at the hotel on Santa Cruz. So, two groups were made. One group had time to walk around the pier and shop some more and the other had the opportunity to get ice cream. I was in the ice cream group. First, we actually spent some time at the pier to look for sharks and other ocean life near the docks. We saw a several animals like big schools of fish, sea lions, white and black tip sharks, a sea turtle, and sting rays. Many pictures later, we headed out for ice cream. On the way there there wasn't much to see. The ice cream parlor was actually very pretty with and open air counter for patrons to sit facing the street. We ordered and sat down to chat. After a few more laughs we began heading back to the hotel. On our way back there was an art shop. The artist actually owned the shop. So three others in the group including me went in to shop for a bit before heading back and then to bed for the night. View more photos from Day 5 HERE! "I love the stars. In the city you can't see them because of the light pollution in the air. Here, on top of the hotel with all lights off the stars are crystal clear and super bright. I've noticed that you can't see the moon probably because of our location, which is interesting. Also, the sun and moon don't shine at the same time in the Galapagos. The stars are bright and beautiful. -Gabriella V.
Left: See a slideshow of student-taken images that capture the natural beauty of the Galapagos! On the ground it was foggy, but in the sky it was clear. The flight today was early, but refreshing, with a few mix ups throughout. After a late wake up call gone rogue, we soon discovered if the galapagroup can handle a quick change, we can handle anything. Just three days in, and we already have an extensive photo library of people sleeping in strange places. As Kyra says "3 hours of sleep in 3 days". We boarded the plane relatively easy this time through and because we're courageous, we tried the interesting in flight snacks. We even got to walk off of the plane by stairs, just like in the movies! We landed in Baltra and continued on to Santa Cruz. The entire Galapagroup had high spirits during every step of the journey to the Galapagos, and the wait was well worth it! The first adventure once in Santa Cruz was lunch in the highlands. Our first meal in the Galapagos did not disappoint. We ate plantain, chicken, rice, vegetables and more, flavored with a local sauce. We also experienced the delicious local fruit juice for the first time! It now seems that each meal will involve juice and a debate about the juices' ranking. During lunch we overlooked giant tortoises and some of Darwin's finches. We then got to go on a walking tour throughout the tortoises' habitat! Our local tour guides taught us about the conservation efforts to support various giant tortoise species throughout the Galápagos Islands. We also learned about the tortoises mating an reproductive behaviors and evolutionary adaptations. After the tour we headed to the port to load up in our boat that would transport us to our next stop, Isabella Island. Spirits were exemplified high during boarding as we waited in line beside sea lions and marine iguanas. We boarded our ship and set sail! For the first 30 minutes of the two hour boat ride, a ridiculously large smile was smeared across the Galapagroups' faces. After that, the waves started to kick in. The unique intersecting currents around the Galápagos Islands are a large factor in the local biodiversity and evolutionary history. 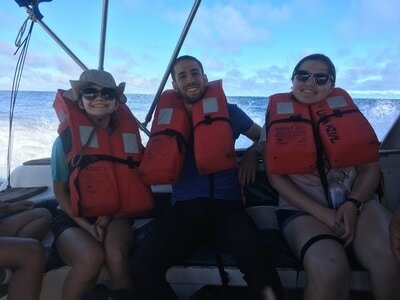 However, after a half hour on this boat, we were not too pleased with the Galapagos' waters. 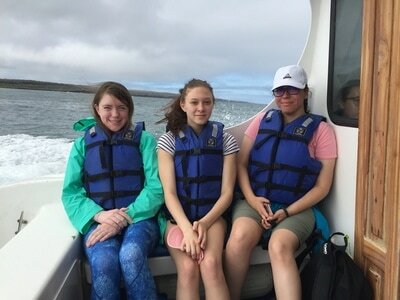 Although Tanya claimed that we have 'stomachs of steal', the boat ride ended with 3 members of the Galapagroup getting sick - one student and two chaperones. Who would have guessed? By the time we arrived in Isabela, it was time for a few selfies with sea lions, boobies, iguanas, and crabs, and then back to the hotel. We checked in and went to dinner just down the street from our hotel. Dinner was a joyous event with delicious juice, soup, and more food! We all enjoyed being 100% unplugged to the internet and our phones and just talking and getting to know each other. Already the Galapagroup has shared an experience that will bond them forever, and this is just the beginning! After dinner we headed home for some journal time and reflection. During this time, we quickly came to realize that no picture or story about the Galapagos could ever do justice to this majestic wonder. When asked what one word we could use to describe the Galapagos so far we would have to say, surreal, HECK-YEAH, tortoises, refreshing, intense, enchanting and endemic. View more pictures from Day 3 HERE. Today, we headed for the O'Hare Airport bright and early in the morning... at 2 AM. 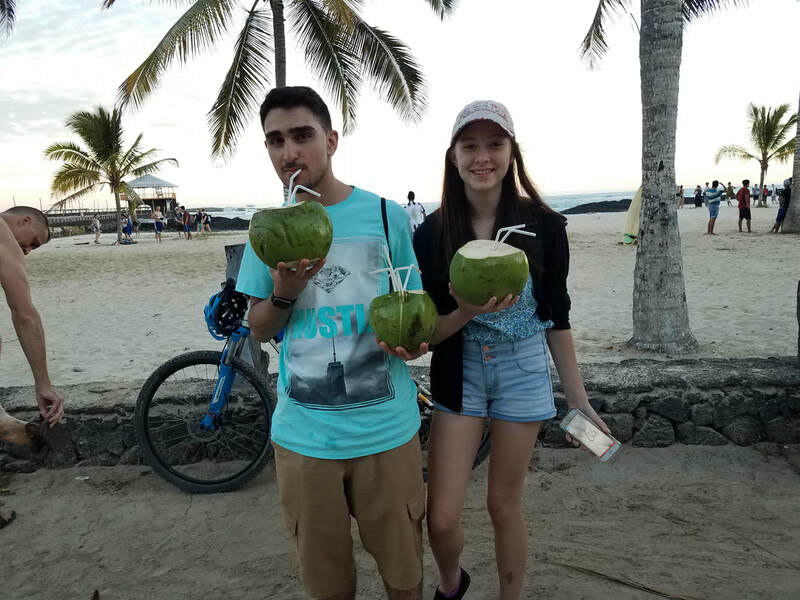 While most teenagers would still be up playing video games or watching Netflix, these rock stars were up with a positive attitude and a smile on their faces ready for the adventure of the day. After a sleepy flight, we arrived in Miami with 2 goals. The students searched for food, while Mr. Molfino and Ms. Sato searched for 3 student's bags. These bags were checked in at O'Hare yesterday and the airlines sent them, but not us, to Miami last night. Not good. (Do not worry, these 3 resilient students were able to go on a shopping spree at Target last night). In Miami, a very helpful airlines employee located these bags (YES!) in their storage area and took me there to retrieve them. The bags and their owners were reunited and we then divided into 3 travel groups. Mr. Walker's group arrived first in Quito after a long (5 hour!) layover in Miami. The students were awesome, finding activities to keep them busy. From Heads Up to Uno, there was some fierce competition at gate E30. 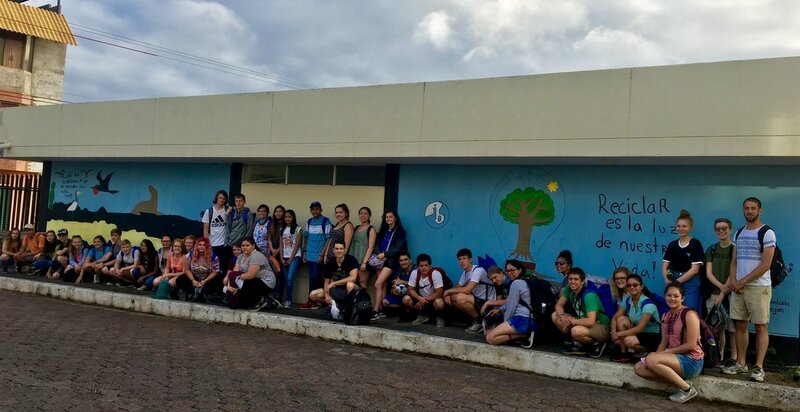 Mr. Molfino's group had the opportunity to go to 1 more country than the rest of us! They traveled from Miami to PANAMA then on to Quito. These world travelers have another stamp on their passport, and the rest of us are jealous. Mr. Koester, Ms. Schuld & Ms. Sato took the largest group that had the longest (8 hour!) layover in Miami to visit Ms. Schuld's alma-mater, the University of Miami. Education First supported us in offering this college tour for our students. Ms. Schuld took us on a private tour of the U, showing us their School of Architecture, freshman dorms, the union, and Lake Osceola. We then ate lunch at the union like a normal college student would! Josh, Rohit, Adam and Gabe were on the constant look out for DJ Khaled and Pitbull. Unfortunately, these gentleman were not spotted. I have been consistently impressed by every single student on this trip. They have been patient, kind, happy, and respectful even though there have been some unavoidable circumstance. Additionally, all of these students are now pros at going through security efficiently! *Note: Wifi in the Galapagos will be spotty. If you do not see a blog post, do not be alarmed. No news is good news! View more pictures from Day 2 HERE. ​Today was interesting to say the least. After many goodbye hugs and tears we left Reagan at 6 AM without a hitch. We made great time and arrived at O'Hare with plenty of time to spare. Check in and security were a breeze, as was boarding the plane. Unfortunately, our flight was held up right before takeoff, due to a mechanical issue. We unboarded the plane and eventually were told that our flight was cancelled. That's when our wonderful team of students and chaperones sprang into action. Ms. Schuld, Ms. Sato, and Mr. Molfino immediately started working with our tour agency and any available airlines to book the next available flight. ​Mr. Koester and Mr. Walker stayed with the students and were blown away by their patience and positivity. The group stayed entertained and positive throughout the rebooking process. Their patience was rewarded with food vouchers, authentic Chicago deep dish pizza, and most importantly, flights booked for early Thursday morning. ​Thanks to everyone for their display of extreme patience and self-control in the face of less than ideal circumstances. The team is looking forward to recharging tonight and making it into Quito tomorrow! View more pictures from Day 1 HERE. All of the students getting ready for our 9-day Galapagos at the Bon Voyage meeting!! There is a lot of excitement in the room as the students review the schedule, rules and expectations for the trip. This blog will be updated by students and chaperones!